You know what they say, one good turn deserves another. I had so much fun with my last blind review that I jumped at the chance to do another set. The only difference is these will be full reviews on each one. Starting with Cigar #1. This is Cigar #1 of 5 that our friend Brooks has sent my way. For those of you who don’t know, Brooks run the blog smokingstogie.com. He specializes in retardedly expensive, extremely rare, and the absolute hardest to find sticks. With a statement like that who wouldn’t jump at the chance to review a few random sticks he decided to send? To be honest, I’m still hesitant. I know almost for sure, the caliber of the cigars I smoke (and my palate for that matter) are incredibly short of what Brooks is. It’s intimidating. Knowing that, it should be fun to see how completely far off I am on each one of these cigars! 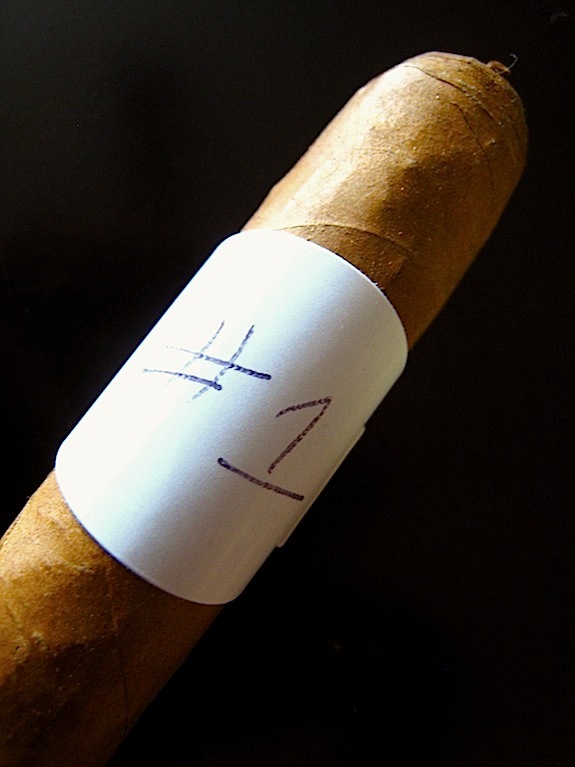 Prelight: Blind cigar #1 is a very small, short, pettit corona sized stick. The wrapper is a very light, and consistent light brown. 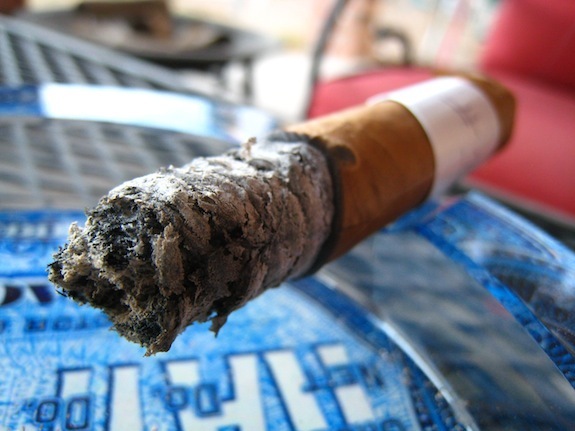 The foot shows a little sign of wear and tear, which leads me to believe is a more delicate style tobacco. The body is very well constructed, with no soft spots and very little veins leading up to a nice little triple cap with a cute little pig tail. The cigar doesn’t give a whole lot of resistance when compressed. This is an awesome little sized cigar. The wrapper doesn’t give off much more than a faint grass smell whereas the foot bares the same grassy smell with just a bit of spice on the tail end of it. The cap clipped clean using my Palio double bladed cutter. There was a few shards of the wrapper that broke off leaving the binder exposed, but I’m not too worried about it. Again, it goes to show that this cigar is using a much more delicate tobacco for the wrapper (possibly Cuban or Ecuadorian?!). The cold draw produces a very clean, natural tobacco and earth flavor with a few citrus and spice notes lingering in the background. First Smoke: I am immediately greeted with an explosion of unexpected pepper when first lighting up this cigar. After only a few draws the pepper fades into as little as an undertone for the strong tobacco, woodsy, grassy flavors. There is a little bit of citrus and sweet spice on the aftertaste as well. The draw on this cigar is insane. It’s not very loose, but you get a whole crap load of very thick smoke with each little puff. This cigar gives off a standard amount of stationary smoke, but the odd thing is the smoke is straight up cedar scented. Cedar isn’t a dominant flavor in the cigar’s profile but you can pick up a ton of it, as well as lots of pepper in the retrohale. The burnline is a bit thick, but is consistently even leaving behind some very light grey, nicely compacted ash which held on for about an inch before falling off. Halfway There: The pepper in this cigar is still teasing me. Each draw I take begins with just a nudge of pepper before transcending into a very earthy, woodsy flavor leaving behind just enough pepper to tease the back of my throat. The citrus and spice are still there but at this time the pepper has reduced them to just an afterthought. I am loving the hell out of how easy and massive this draw is. 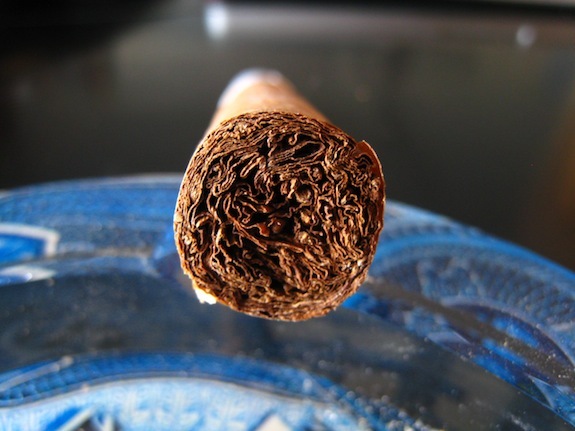 The burnline has started to develop some smaller waves into the second third which quickly correct themselves before relocating to another part of the cigar. It’s like watching some sort of juggling act. I don’t know if it’s all the pepper or the actual nicotine but I am actually starting to develop a little buzz off of this tiny little cigar. Finish: This cigar does pack a punch. I love it when smaller sized cigars carry a medium to full body vs. the run of the mill mild. The pepper has lasted the entire length of the stick and still remains a major player. The cedar taste is now, finally showing through with a sweet citrus aftertaste. 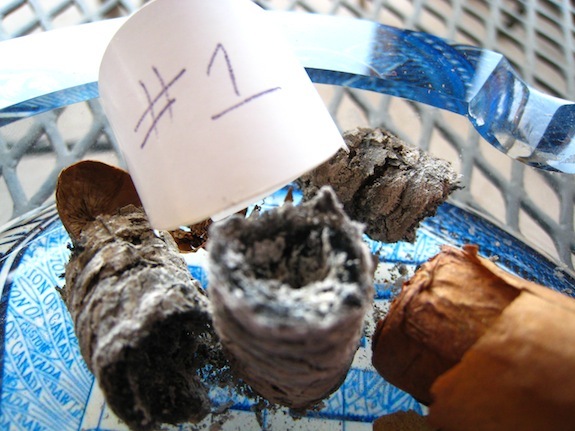 Despite the open draw this cigar showed little signs of harshness into the final puffs. It didn’t even heat up all that much. After all was said and done this cigar only took me about an hour to take down. Normally, it would have been a lot shorter than that too but I really wanted to sit back and pull apart the notes. Even then I’m left almost clueless as to what this cigar could be. 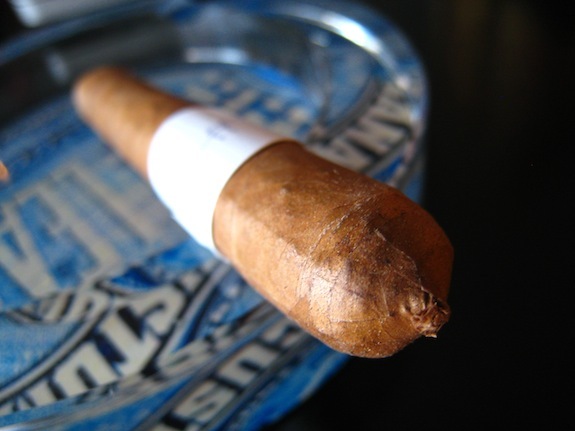 Overview: At first I wanted to call this cigar Cuban and be done with it. But the pepper and the body really made me think otherwise. I immediately think Nicaragua, Pepin made maybe? But I really can’t think of any cigars coming out of his factory in this size or even with the pigtailed cap. Whatever it is, the manufacturer was able to produce a perfect mash-up of flavor, and strength in such a small, compact vitola. I’d smoke this cigar again in a heartbeat (unless of course, it turns out the be a gurkha, then I’ll just quit doing reviews for good). First cigar from Brooks and I am already stumped. If this has anything to say for the next four cigar then this will be a wild ride indeed. Final Guess? I have No clue. If I had to guess though I would have to say its some kind of crazy Cuban hybrid or a Cohiba I haven’t had before. I haven’t had many of the Cohiba’s, but the construction and appearance alone are on par with this cigar. The pepper and body were just too much to be the run of the mill Cubans that I am used to. 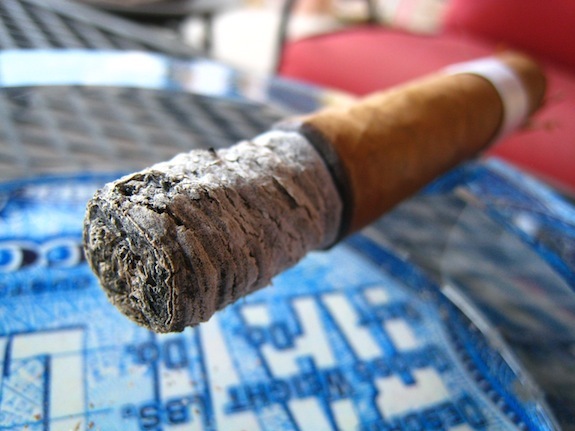 On a side note: The cigar looks damaged to hell in nub form. This didn’t happen until the final few draws. Even the unwrapping that started once I clipped it didn’t pose a problem until I was just about done with the stick. So what was it? It was Tatuaje’s Cabaiguan WDC 120. You can view Brooks’ review here. I know, I know, way off. But on the plus side, Tatuaje’s whole existence spurred from Pete Johnson wanting to develop blends that mimic those of the best Cubans out there. And had I kept with my instincts and called it a Pepin Blended Nicaraguan I would have been dead on. You gotta give me at least a little credit. The wrapper was in fact Ecuadorian too if I’m not mistaken. I can almost always confuse that leaf with natural Cuban. Pairing: I paired this, as well as all of the cigars in the blind review with Brooks with water. If any of you read Brook’s Blog (smokingstogie.com), you know what this guy is capable of. Knowing the caliber, and rarity of the cigars he smokes I am almost certain I hadn’t had any of the sticks he sent my way so I am trying to keep my palate as precise as possible. I just noticed these pictures came out super yellow… no idea whats up with that. Crappy lighting I’m sore. Great review. I give more credence to ‘blind’ reviews than others. And I have to say that I’m enjoying smaller ring gauge cigars more than the 54 plus cigars. Nice. From what I’ve seen, Brooks’ stash is RIDICULOUS. Im sure you have some awesome stuff waiting for you. Thanks for another great “blind” review. @Kekoa – Thanks for the lienency. 🙂 This is probably the closest I’ll get to all the blind reviews. @Danny – Exactly! Can’t wait to fire up the next one! Just wanted to let you know how much I enjoy these blind reviews. It’s always fun to see the reactions from someone when they have no sense of packaging, marketing, origin, etc. I’ve given my neighbor a few Thompson’s I’ve had for years and he always thinks he’s getting the cream of the crop from me. C’mon, I like the guy but not that much! Just glad he doesn’t know any better. Thanks Jake! There are plenty more coming. And as far as sneaking out sticks from the moochador?! You gotta do what you gotta do! Of all guys to get cigars from. You are a lucky man. Nice review. It burnt super nice from your pics. I need to get some of these…. I keep hearing and reading how amazing they are…. Well done! And Yes I am envious of you and Brooks… Not really envious of Big D….. but well he is Canadian…. lol..
@Tri – EXACTLY! bwahahaha, by the way. I didn’t forget about your comment about our readers beng involved with blind trades. I’ll have Daniel chime in here, but he actually puts them together! 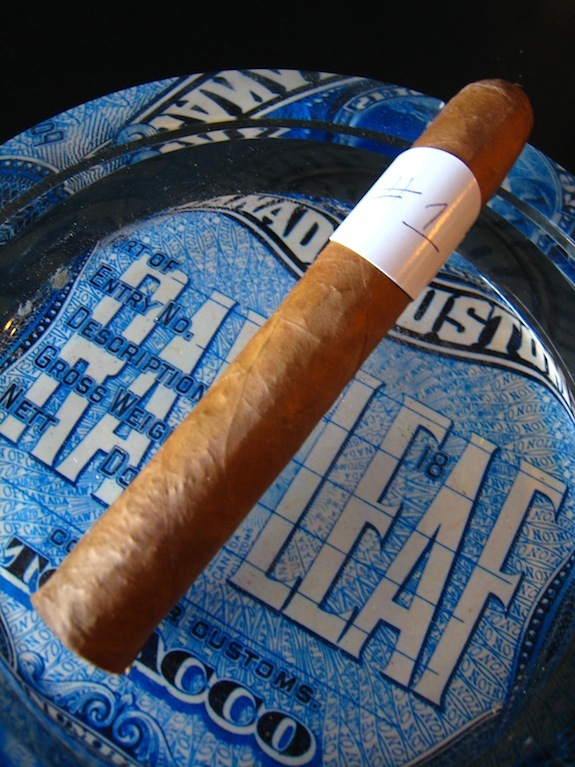 @Tadd – Yeah the burn was super clean, something I didn’t expect from a cigar that size. Nicely done Tony, can’t wait to see what else Brooks has in store for you! @TriMarkC Let me know if you want in on the next trade and I’ll include you in the email! Hmm.. Cabaiguan, eh? I have to admit, I tend to overlook those when I see them. Maybe I need to pay more attention. @boomer – you know, I hear that a WHOLE lot. I think its a blend you either love or you hate. I love them (especially the guapos maduro), but I know it just doesn’t float the boat for a lot of people. Another solid review. As I was reading, I guessed Tatuaje just because I have smoked a few Cabaiguans and loved them. Curious to see what else is in the blind review series.